Diogenes of Sinope (412-323 BC), also known as Diogenes the Cynic, was a Greek philosopher probably best known for his fruitless search for an honest man. He used to roam about in Athens in full daylight with a lamp in his hand and when asked what he was doing, used to reply, ‘I’m just looking for an honest man.’ He looked for a human being but reputedly only found rascals and scoundrels. However, equally remarkable was his ability to act out the message he was trying to convey. Lore states that in a debate about the nature of motion, Diogenes, in response to an adversary’s argument that motion does not exist, stands up and walks away, prompting the Latin phrase ‘ solvitur ambulando.’ Although the literal translation of ‘solvitur ambulando’ is ‘ it is solved by walking’, the common interpretation of the phrase is that a problem is only solved by practical experiment. Virtue is better revealed in action than in theory. Diogenes was born at Sinope (modern-day Sinop, Turkey), was exiled and moved to Athens where he challenged and criticized the established customs and social institutions. He called himself a ‘citizen of the world’ (cosmopolites) and is credited with the first known use of the word ‘cosmopolitan.’ This was at a time when a man’s identity was intimately tied to his citizenship in a particular city-state. Diogenes was an exile and an outcast, a man with no social identity, but he made a mark on his contemporaries. Diogenes was captured by pirates and sold as a slave in the Greek city of Corinth where he grew old and died at an age of 89. The Corinthians erected to his memory a pillar on which rested a dog as there were many stories of Diogenes referring to his ‘dog-like’ behavior and his praise of a dog’s virtues. 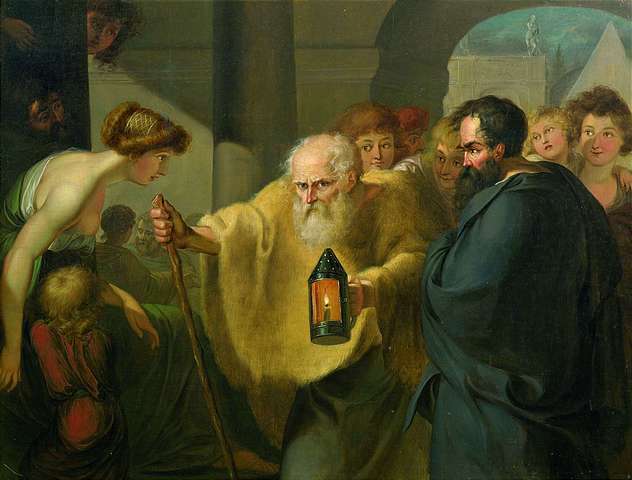 Diogenes tried to show that wisdom and happiness belong to the person who is independent of society, civilization, family, politics, property and reputation. Like Diogenes, perhaps one can solve the most complex problems of life by walking away, stop being offended, letting go of the need to win, letting go of the need to be right, letting go of the need to be superior, letting go of achievements and reputation. And on this path one can hope to have more success than Diogenes’s search for an honest man. Perhaps someone has a lamp we can borrow……. This entry was posted in Navid Zaidi and tagged cosmopolites, Diogenes, philosophy, Plato and Diogenes, Tischbein, walk away. Bookmark the permalink.